#OscarsSoWhite, the hashtag heard around the world, has officially upstaged the fact that Leonardo DiCaprio may win his first Oscar this year. Academy Award winner Leonardo DiCaprio is on the verge of being an afterthought. The hashtag has been around since last years’ Oscars, and it’s being used to talk about the lack of diversity in the Oscars. People on twitter are using it to vie for movies like Straight Outta Compton, which only received one nomination for Best Original Screenplay, or for performances by Will Smith and Idris Elba. Despite the fact that my top 10 list, along with many other bloggers, is diverse in representation, Spike Lee is pissy at what the Academy thinks and about the “lily-white Oscar nominations” this year. And he’s not the only one. Will Smith’s wife, Jada Pinkett Smith, was so aghast with the lack if diversity in this year’s nominee list (read: her husband wasn’t nominated) that she staged a boycott against the Oscars blaming the Academy for the lack of diversity in the industry. The lack of diversity is a disappointment, but the finger-blaming needs to be at the industry where this whole process begins, not the Academy. And to make matters worse, the Academy is actually taking the bullet for the backlash against the white-washed Oscars. WHY? Here’s my list of top 10 personal favorites of 2015. Bottom Line: One of the more profound explorations into the not soon distant future of AI technology. Be afraid. Be very afraid. Bottom Line: Visually as powerful as it is painful to watch at times. Nature overload. Dicaprio will win his first Oscar for his endurance. Bottom Line: Reinvigorates an old franchise and does it the right way with standout performances by all involved. Stallone is an Oscar front-runner. Bottom Line: One of the more clever and horrifying movies I’ve seen in a long time…not to mention brilliantly shot! Bottom Line: Although the story may be watered down, it’s a powerful story to be told regarding success and the complications that accompany it. Significant Oscar snubs here regarding performances and movie. Bottom Line: The most harrowing story told on screen in 2016 with some of the year’s best performances. Another example of Oscar snubbing. Bottom Line: Another gem from Tarantino; albeit it’s not his best work, but it’s damn good work with tremendous acting and great dialogue. Bottom Line: This is definitely one of my favorites of the year with some great performances by Benicio del Toro and Emily Blunt and a lot of nail-biting scenes. Oscar snubs again. Bottom Line: Anyone familiar with the Mad Max franchise knows certain components of this post-apocalypic world are guaranteed: over-the-top car chases, daring stunts, macho cars and the patriarch behind it all–Max Rockatansky. As someone unfamiliar with the Mad Max movies, I’m VERY impressed with this reboot. Bottom Line: J. J. Abrams successfully tackled the vast universe of Star Wars and made it his own. This is a blockbuster that I think is safe to say can be considered a classic of the year. I am so sick of the #OscarsSoWhite nonsense. It is such a misguided movement. You said it, Oscar isn’t the problem. Look at the studios and the industry itself. I happen to think the Academy did a really good job with nominations this year (even though I would have picked a few others if I was in charge). But the lack of diversity goes back to Hollywood and that is where the ire should be aimed. Completely misguided. You’re right. Thanks for commenting! Nice top 10 Courtney!! We share 4 films :)) I really agree with the Oscars so white thing although the problem is more systemic and goes back to the very first stages of casting. I’m so happy you love Beasts! Great taste haha 😊. All in all, a smahing list! I knew you’d be displeased with The Revenant making my list at all! It is what it is. Let’s be honest…it was a weak year. Don’t think it was a particularly spectacular year for films. I did notice too that Jada’s argument happened the year her husband starred in a more serious role and wasn’t nominated. I think it was an extremely weak year; I’m surprised I was able to come up with this list! Do you remember when No Country for Old Men and There Will be Blood were fighting for Best Film? I’m so over #OscarsSoWhite. The problem isn’t just with the Oscars. Great list! I had a lot of these on my own as well. I still need to see Straight Outta Compton and Creed. Omg please check those two movies out…they’re really fantastic!!! Of all the snubs mentions for this year’s Oscars, Oscar Isaacs for Ex Machina truly stunned me. I wasn’t a big fan of the film but his performance was eccentric, scary, and so good. Great list! Thanks, Katy! I agree about Isaac. 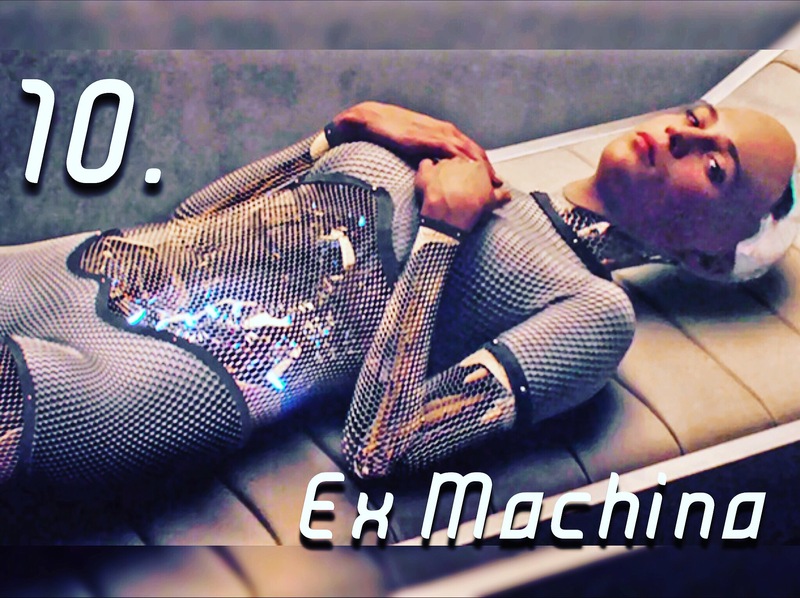 Ex Machina as a whole was very overlooked, unfortunately. Definitely check out those two movies…they won’t disappoint! Great to see Star Wars and Mad Max so high! Straight Outta Compton was an enjoyable history lesson. Of the films I loved that missed your list, those would be Inside Out, Far from the Madding Crowd, and Victoria. Great list. We have a lot of similar picks. Really like that The Revenant made the pick and Mad Max being so high. Great recap here. I like what Ice Cube said, and I think Chris Rock addressed some of the diversity issues head on last night by calling out Hollywood AND the people boycotting. As for your list, we have some in common, three movies here are on my top 10 list of 2015 (Ex Machina, Fury Road, & Creed). I wish I had seen Sicario sooner, that would’ve made my top 10 for sure. I was rooting for Fury Road to sweep everything, including Best Director and Best Picture, but I’m glad Spotlight win over The Revenant though. Well, I think we’ll have different list. I haven’t posted mine yet, just draft but I have something really different. I didn’t like Star Wars Force Awakens like you, it was a nice nostalgic movie to me. I think Oscars really back bite the whole boycott on the event, through Chris Rock. Especially when they interviewed the black people and they said they didn’t watch any Oscar nominated movies except Straight Oughta Compton. Good observation Andina about the Oscars biting back. Clearly there are not enough black nominees this year, but Chris Rock showed in the interview that the Compton moviegoers are selective too. (http://www.vogue.com/13408249/chris-rock-compton-moviegoers/) So it’s not just the Academy who are biased. Nice list. As you know, we share Hateful Eight and Fury Road, both of which are top-notch movies in my book. While I appreciated elements from both It Follows and Ex Machina, I felt the form suffered from the typical horror tropes and the latter featured strong performances by Isaac and Vikander, Gleeson felt miscast in my view. Don’t get me wrong, I think both are good movies but I was disappointed given the critical hype for those pictures. I love this list! Not high on everything but I believe most, except for It Follows in my opinion, are deserving of consideration for the Top 10. Sicario may be my top from 2015. I’d somehow try to find love for Inside Out, The Gift, Spotlight, and maybe The Big Short, too. Thanks! I couldn’t get into Spotlight, and I haven’t seen The Gift/Big Short. Thanks for checking out my site! WOW! Loved this list you were brave enough to do a top 10 whilst I only could do a Top 5 because I am that indecisive. Star Wars was sorta my number 1 but I could not rank them. Haha. Great list of films too and you encapsulated the story and quotes that represent each movie in such a strong yet succinct way. Now I absolutely need to watch Ex Machina. It has been on my To Watch list for ages and keep coming across such positive posts about it! As for Mad Max – it just blew me away – what a brilliant piece of art! Good list, although I’d put Ex Machina in a higher position. P. S. Did you do the same list for 2016?